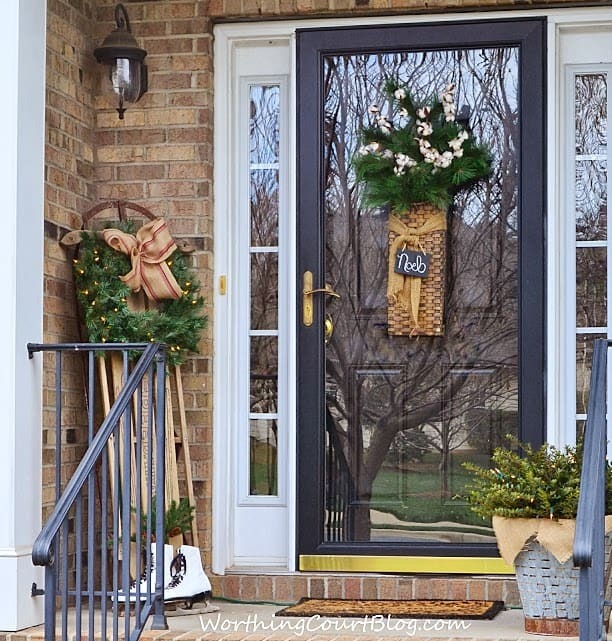 Enjoy this project for the front porch of our previous home. We’re currently remodeling a new-to-us home. Click HERE to see how I’m totally changing my decorating style! The sight of a big basket filled to the brim with daisies announces that summer has arrived at long last! So as I put together an arrangement for my summer front door, I envisioned myself in a long, flowing, gauzy dress skipping through a daisy filled field in my bare feet, filling my basket with freshly plucked flowers. 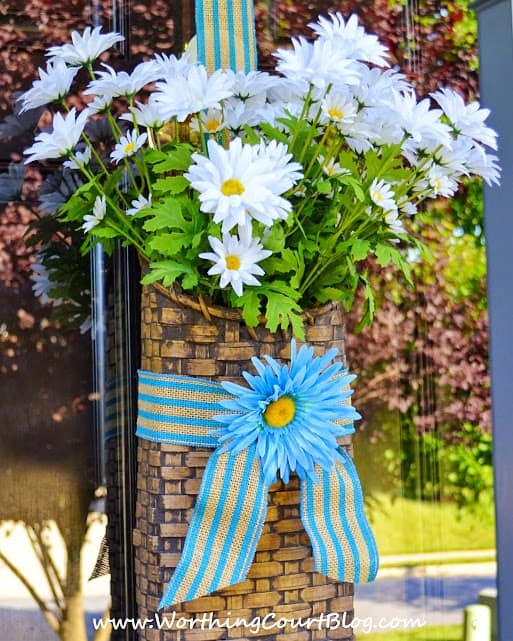 I wanted the summer decoration for my front door to be cheery and colorful, yet simple to put together. Summer is all about casual and relaxed living so nothing too complicated or fussy would do. Door baskets are the best time saver ever! They are sooo easy to change and still look like you put a lot of time and effort into. 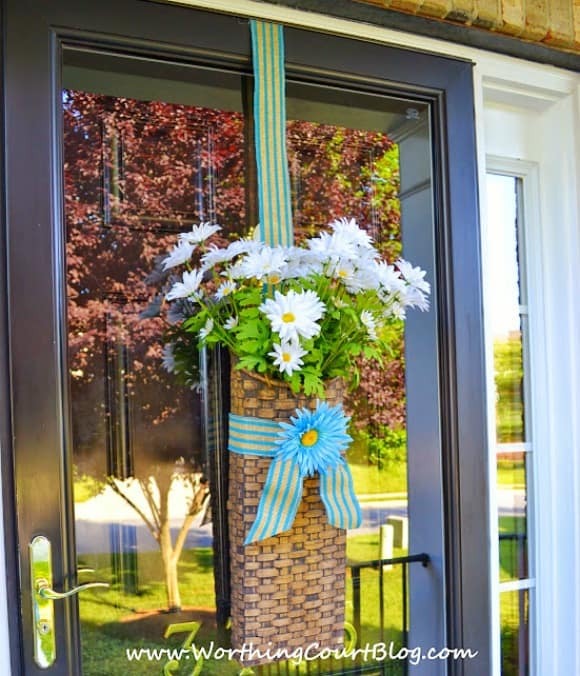 My summer door basket consists of the same daisy bunch that I used in my Summer Kitchen Island Vignette last summer. I stuffed some crumpled up newspaper in the bottom of the basket to raise the flowers up, popped the daisy bunch into the basket and gave them a little fluff. The basket is wrapped with blue striped burlap ribbon from Hobby Lobby. To help conceal the hook holding the basket, I simply added a length of the same ribbon to give the appearance that the basket is hanging from the ribbon. A clip-on daisy from the Dollar Tree is just the right accent. It is literally just clipped onto the knot that I tied. If you don’t have a basket for your door, I highly recommend that you get one! 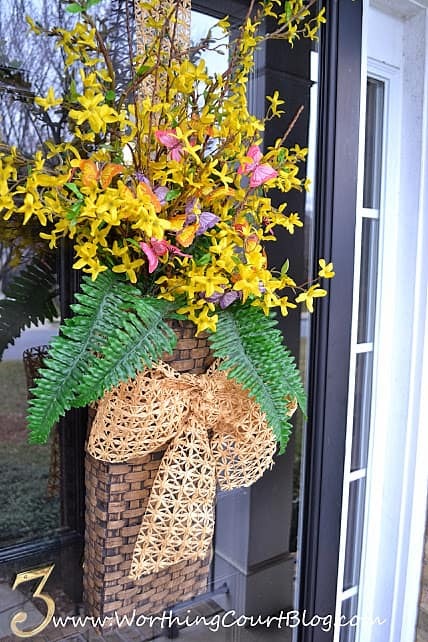 As it turns out, this door basket that I purchased several months ago has turned out to be one the most versatile items to decorate with that I have. Love it!! Love that your basket is so tall and flat. Did you say you found it at TB? Thank you! Yes, I found it at Total Bliss last fall. 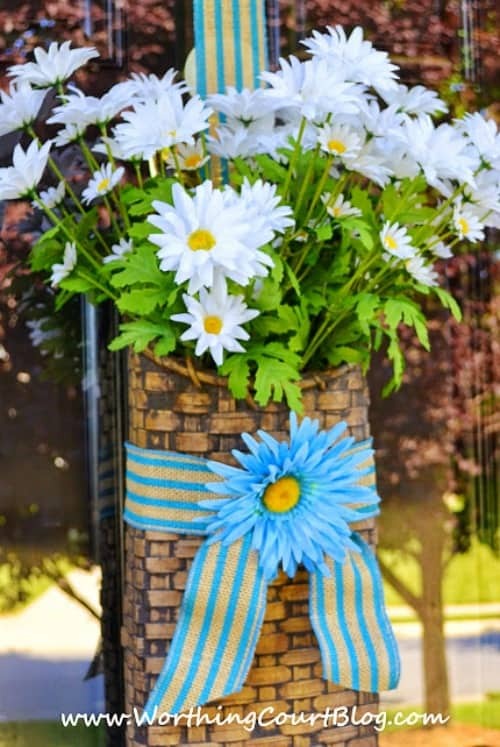 I love your basket filled with daisies! I have looked and looked for a basket for my door but can’t find one. I’m so glad that you like it, Penny. I know what you mean about door baskets being hard to find. I scooped this one up as soon as I saw it even though it was a bit pricey. Turns out that it was a good use of $$$ for me. Good luck on your search! 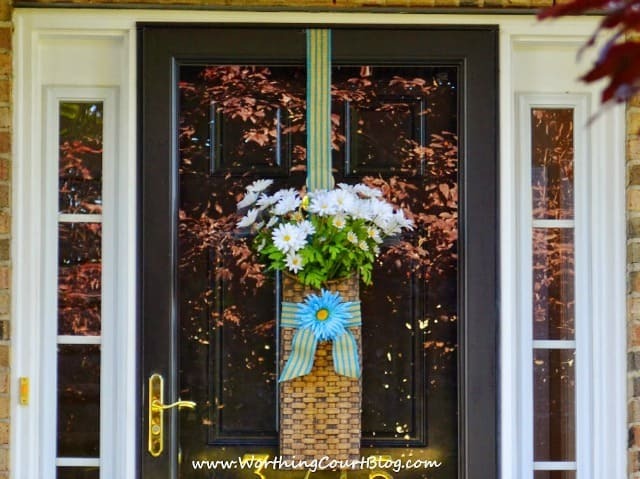 Suzy this basket is gorgeous on your door. 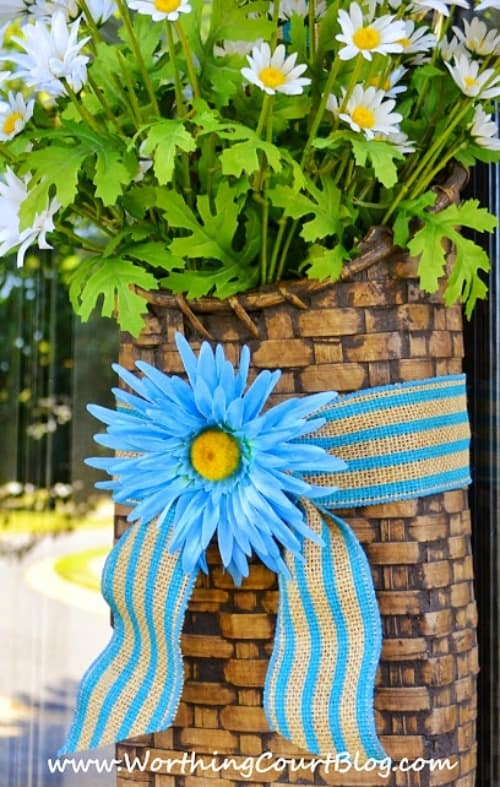 Love that burlap ribbon you found! Perfect touch with the clipped on daisy!! Thank you, Cynthia. I’ve used that ribbon on so many things! Suzy I really enjoy your blog. It is always full of fun and inspiring things. 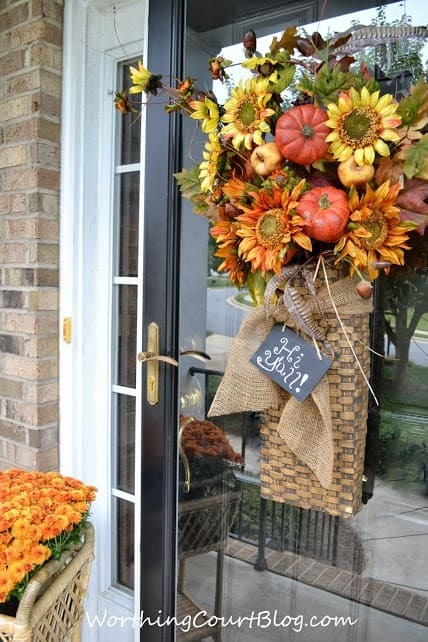 Love the look of your door and porch! Thanks for sharing at #inspirationmonday .